Prime Digital Academy graduates classes of skilled software engineers and user experience designers approximately every four weeks. 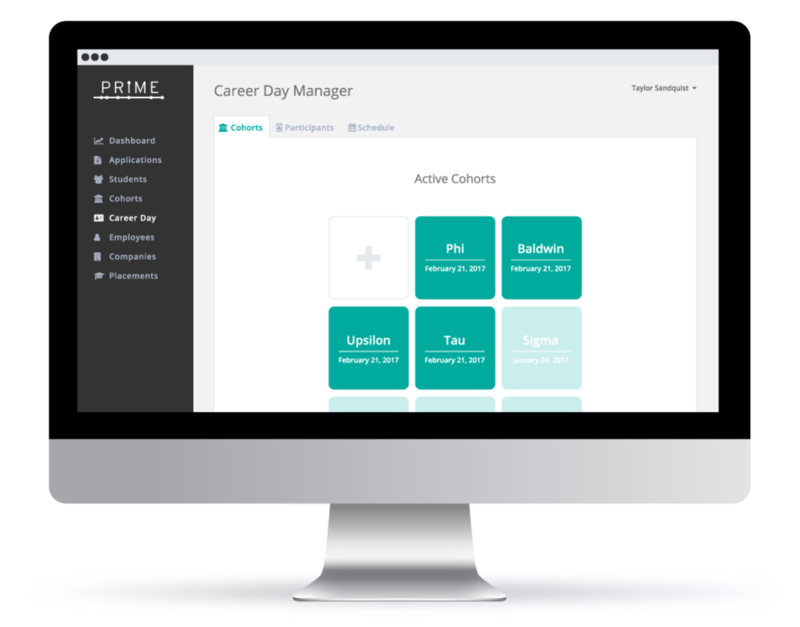 Just before graduation, Prime invites local companies to interview emerging talent by participating in Career Day. Career Day is a way for graduating students to connect with potential employers who have a suitable job opening available, and this app design aims to simplify the process. The Career Day planning process begins about two weeks out with a flurry of emails, something that doesn’t end until Career Day is over. While Prime administrators, students, and partners all have roles in creating a successful event, the most challenging aspect of Career Day is planning and scheduling interviews between students and potential employers. Because of this, the focus of this application is to help facilitate a streamlined process for Career Day scheduling. By utilizing Prime’s existing database and allowing students and partners to input their own information, the administration time involved in receiving, organizing, and making sense of various information and preferences is immediately reduced. Taking that information and presenting it in an easy to use way during the scheduling process will relieve major pain points and allow Prime administrators to focus on facilitating connections between students and partners. 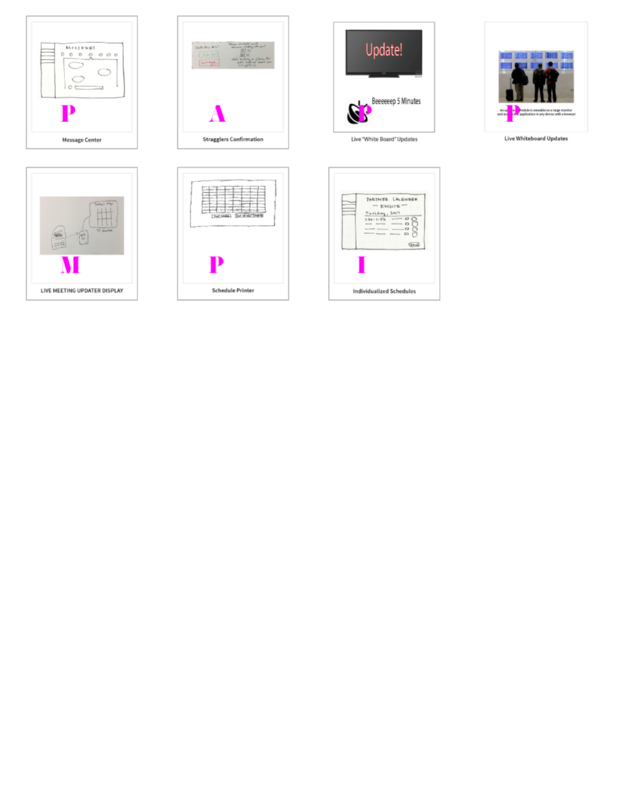 User research and journey mapping illuminated numerous paint points throughout the Career Day planning and scheduling process. A majority of these problem areas clustered around the white-board scheduling, however it became apparent that several things leading up the the schedule creation were making things more difficult than necessary. I observed the Community Relations and Operations Manager as she put together the Career Day schedule, asking pertinent questions about the choices she was making. This, combined with a short question and answer session with her, informed the creation of a journey map which would serve as a roadmap to developing the application. I began by separating my notes onto post-its and organizing various tasks along a timeline. These were color-coded depending on the user—Prime staff, the student, and the partner. This allowed me to identify pain points and opportunity areas along the way, and then used a different color to mark them and flesh out some initial ideas. The final journey map deliverable took the rough outline created in post-its and refined the content. It was important to note where communication was occurring, as this was evidently causing delays and inefficiencies in the process. I also described a brief outline of each phase of Career Day, noted what tools the current process was utilizing, and consolidated pain areas into overarching themes. Because there was so much room for improvements, initial wireframes brought forth numerous features that solved a variety of problems, from integrating tools to automating parts of the process. However, it was also clear that I needed to narrow the scope and prioritize features. To do this, I used a Kano Analysis to determine which features were resonating with users and which were missing the mark. Three Prime staff members were asked to look at the features and rate them on a scale of "I like it" to "I dislike it" in relation to the questions "How would you feel if this feature was present?" and "How would you feel if this feature was absent?". This helped gauge not only what they were liking and disliking, but also how necessary certain features were. I used this guide to interpret and quantify my results. The Kano Analysis helped me focus on specific features that could be implemented in an initial build phase, meet development time and cost restrictions, and potentially be built upon to include other features as needed. I focused the new wireframes on a few features that would most impactfully reduce identified pain points in the planning and scheduling process. By utilizing Prime’s existing database and allowing students and partners to input their own information, the administration time involved in receiving, organizing, and making sense of various information and preferences is immediately reduced. Taking that information and presenting it in an easy to use way during the scheduling process will relieve major pain points and allow Prime administrators to focus on facilitating connections between students and partners. To best organize the various parts of the planning process, the web application has three sections: Cohorts, to view and manage different groups of students Career Day dates; Participants, to view and manage students and partners involved in each career day; and the Schedule itself, which functions as both a tool for simplifying the process and a way to display the information during interviews. To discover these features in more details, please view the annotated wireframes here.